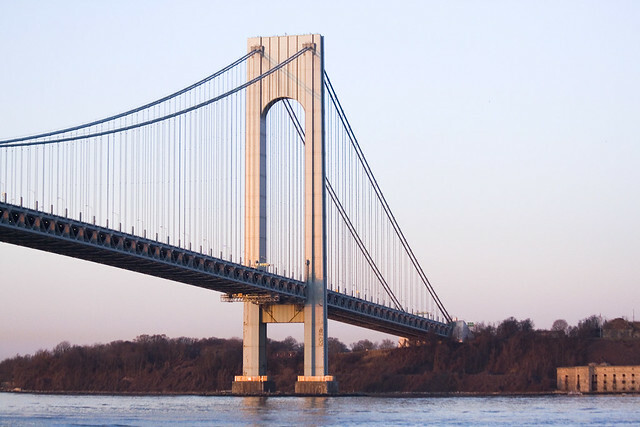 So, you know about the Verrazano Bridge, right? When they were building it, and pouring the cement- workers who fell into the cement would just sink in, and there was nothing that could be done to save them, so the bodies are still in the Bridge… As far as the Grandfather’s brother, versions of the story told by others involved every possible male acquaintance or familial description possible. The foundations, which support the 264,000-ton weight of both the towers and the suspended deck, as well as a design live load of 16,000 tons on the deck, were dug 105 feet below the water on the Staten Island side, and 170 feet below the water on the Brooklyn side. Conventional foundation design called for sand islands that kept water, as well as provided working and storage space. However, because the currents were swift and the ground was unstable in the area, sand islands were not constructed. Instead, “cofferdams,” or vertically interlocking steel sheet pilings, were driven below the surface to protect the caissons. Above each 13-foot-high caisson base, muck and sand were dredged out of 66 vertical concrete shafts. When the caissons reached their predetermined depth, the shafts were filled with water, and caisson tops and bottoms were sealed with concrete. The two tower piers, which contain a combined 196,500 cubic yards of concrete, were completed in less than two years at a cost of $16.5 million. Two anchorages were then constructed at either end of the Narrows. Each anchorage stands 130 feet high, 160 feet wide and 300 feet long. 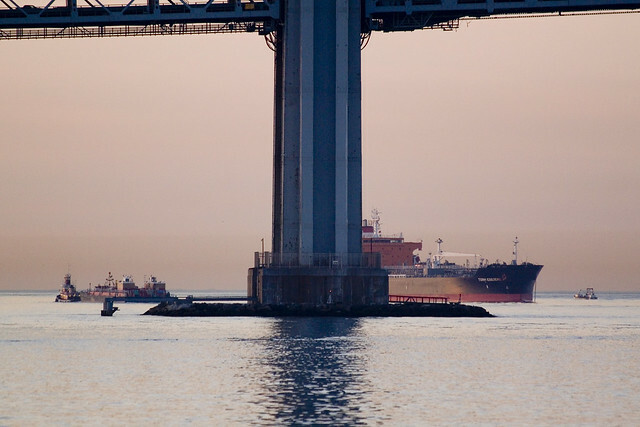 However, because of the differences below ground, the Brooklyn anchorage contains 207,000 cubic yards of concrete, while the Staten Island anchorage contains only 171,000 cubic yards of concrete. On their inshore ends, they support the two decks of bridge approaches. On their outshore ends, they carry four massive, roller-mounted saddles that support, and move with, the four cables as they change length, either because of temperature changes or because of load changes. The hand-polished concrete exteriors have diagonal patterns that continue the path of the suspension cables. Inside the anchorages, forces from the suspension are transferred at two points: the front of the anchorage (where the compacted cables bend around saddles that rest on inclined steel posts), and near the heel of the anchorage (where eyebars transfer force to inclined girders buried within the concrete). The anchorages cost $18 million to construct. This urban legend- and yes, it is– was once omnipresent in the land of Egg Creams and really good Pizza. So much so that it actually made it to the movies, as you’ll observe in the clip from “Saturday Night Fever” presented below, courtesy of youtube. For a great first person description of the building of the bridge, and the remembered effects of building the Brooklyn pierage in Bay Ridge- check out the inestimable Forgotten-NY’s “Bridge in the Back Yard” posting from 2003 here. I can tell you that the old guys in Canarsie and Flatbush who worked on the thing always “beamed” a little bit when driving down the Belt Parkway toward the City and seeing it rear up. Officially, there were three deaths associated with the building of the Verrazano, and the bodies were all recovered. Brooklyn legends notwithstanding, that is actually an incredible number given the size and scope of the project. But what else would you expect from the maestro, Othmar Amman, on his final project? 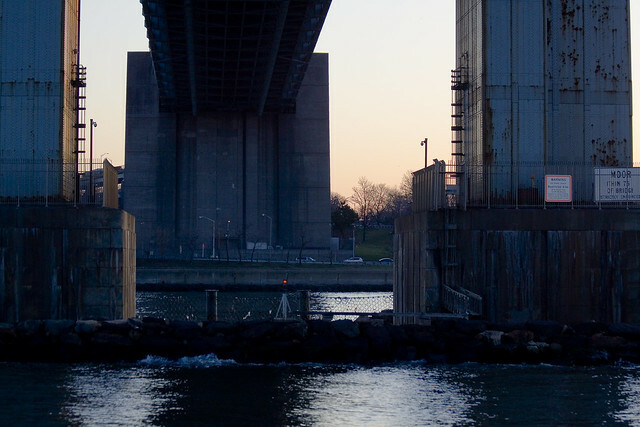 The bridge is owned by New York City and operated by the Triborough Bridge and Tunnel Authority, an affiliate agency of the Metropolitan Transportation Authority. Interstate 278 passes over the bridge, connecting the Staten Island Expressway with the Gowanus Expressway and the Belt Parkway. The Verrazano, along with the other three major Staten Island bridges, created a new way for commuters and travelers to reach Brooklyn, Long Island, and Manhattan by car from New Jersey. The bridge was the last great public works project in New York City overseen by Robert Moses, the New York State Parks Commissioner and head of the Triborough Bridge and Tunnel Authority, who had long desired the bridge as a means of completing the expressway system which was itself largely the result of his efforts. The bridge was also the last project designed by Chief Engineer Othmar Ammann, who had also designed most of the other major crossings of New York City, including the George Washington Bridge, the Bayonne Bridge, the Bronx Whitestone Bridge, the Robert F. Kennedy Bridge, and the Throgs Neck Bridge. The plans to build the bridge caused considerable controversy in the neighborhood of Bay Ridge, because many families had settled in homes in the area where the bridge now stands and were forced to relocate.